We had a wonderful unplanned side trip today. We were planning on just going straight from Durban to Johannesburg today until our host at our guest house told us about stopping about an hour north of Durban at the Mandela Capture Site. He said that, given what we were focusing upon while here, we needed to stop there on our way. We are so glad that we did. Not only did it have a wonderfully detailed and clear history of Mandela’s life (our kids really were able to read through some of the key moments of his life), but there was a sculpture there that was just incredible. 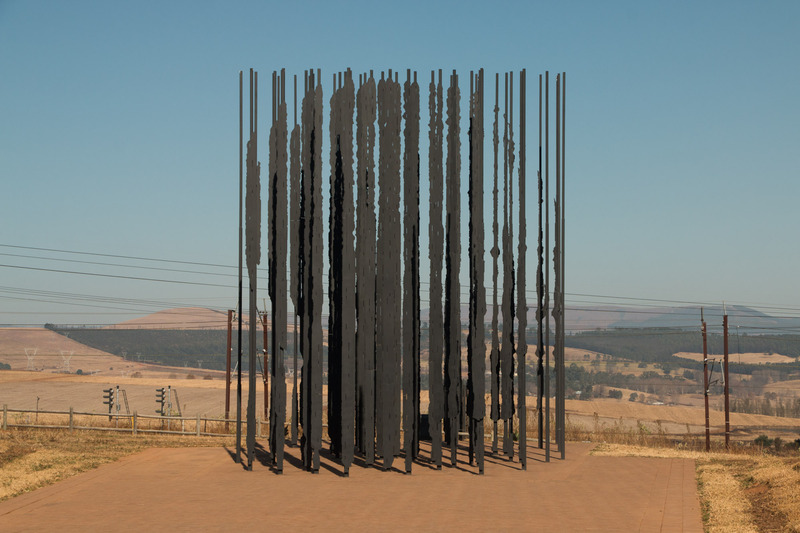 The sculpture is made up of 50 different pieces that when you look at it just right (as in the picture for today), you see the profile of Nelson Mandela. If you move to one side or the other, you can see some of his face and if you move completely away it simply looks like a bunch of random posts. It was really stunning. I took a video of it as well that I will post later (no wifi at guest house). One of the things about the history of his life was the many different pieces of who he was, the changes he made in his perspectives, the victories and the mistakes – it was all there. What was also very clear was the many ways that he was perceived by others – some correctly, some not. I think similarly about Mark 11 – you have the people welcoming Jesus into Jerusalem, some who may have understood the way that Jesus saw his ministry and others who had their own idea of who he was to be. You have Jesus entering the temple and overturning the tables of the money changers – some would welcome what Jesus did, others would have decried it. You have his disciples and his opponents. Depending on the perspective that was held, Jesus was seen very differently. I am not comparing Mandela to Jesus, but the beautiful sculpture today really connected with this passage as it made me think about the ways that I understand Jesus today – do I look at him from the perspective that I want to see him or do I try to see him as he showed himself to be? I am sure its far too often more the former than the latter, but I am trying each day to turn more and more to try to see Jesus as Jesus, not my or others’ creation of who he was.